SIKU 4810 pesado Autogrúa 1:55 nuevo en caja orig. Marke SIKU. Serie Siku Super Serie. Besonderheiten mit OVP. Maßstab 1:55. Material Kunststoff. Farbe Weiß. Farbe Gelb. Siku 2110 Bombero Camión Grúa 1:55 Nuevo en Emb.orig. SIKU 2110 fuego grúa camión 1:55 nuevo en caja orig. Marke siku. Besonderheit mit OVP. Maßstab 1:55. Material Druckguss. EAN 4006874021109. SIKU 4311 MEGA Levantador Grúa Móvil 1:55 NUEVO CON CAJA orig. Marke Siku. Material Druckguss. Material Kunststoff. EAN 4006874043118. SIKU 3730 horca para piezas de la grúa. Marke siku. Material Druckguss. EAN 4006874037308. Carretera de grúa Richier. Grúa Richier. Solido a 1973. Série Solido tonnergam. Couleur dominante Blanc. Couleur dominante Rouge. Année du véhicule 1973. Matière Plastique. 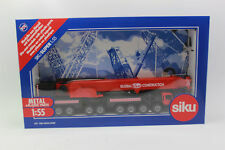 SIKU 1/55 4110 Hydraulic Die Cast Crane Truck markings for GROVE. Siku Crane Grabber 3514 1:55 Scale Boxed (Plastic Loose) Condition: please view photos carefully for condition (plastic is loose, box is worn with creasing, tears and dents, model looks good). Any questions please feel free to ask. SCALE 1:55 No. 4810. THE BOX HAS SLIGHT WEAR WITH SMALL TEAR (PICTURED). Made in Germany by SIKU. MACK Truck Build As: Rotation WRECKER CRANE Truck. 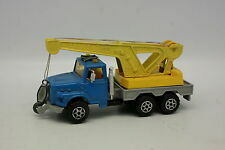 1 x 3-Axle MACK WRECKER Crane Truck. 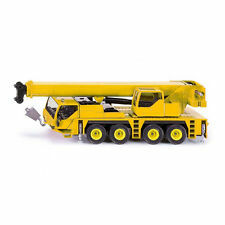 Special Features: Hydraulic Crane Truck with 360 Rotation Action. Opening Engine BONNET on Truck. Siku 3730 Crane Truck Scale 1:55 1999 Die Cast, New in Box. The crane is in excellent condition and has never been out of the box apart from being photographed. THE MODEL IS BOXED, BUT THE BOX IS SLIGHTLY SHABBY - SEE PHOTOS. CRANE TRUCK. AS FAR AS I KNOW THIS MODEL HAS NEVER BEEN OPENED. 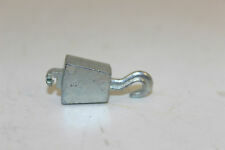 The hook is new therefore in excellent condition. 1:55 Heavy Mobile Crane - Die-Cast Vehicle - Siku 4810. 1/ Scale Model by SIKU. Our aim is to ensure no matter what the model, we will provide an excellent service experience. Ending Soon. New Arrivals. The RM Toys Team. Kind Regards. GRADING CONDITIONS. 1/ Scale Model by SIKU. FAIR - The item will have heavy signs of wear, showing major imperfections. The MODEL Is In NEAR MINT Condition - previously displayed. The BOX Is In GOOD Condition - worn. 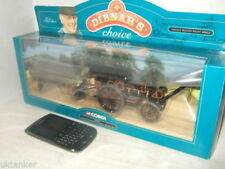 Matchbox'sClassic BATTLE KINGS Collectibles Diecast Model. 3 Axle BIG Recovery Truck with REAR LIFTING Action. Special Features: Army Color & Rear LIFTING ACTION with 1 HOOK. Promotion Label on Truck: 66 Repair or maybe make you own. Made in Germany by SIKU. Text on Truck: FAUN HK 028.5. MINT in Box. Made in Germany by SIKU. 1 x 3-Axle DAF 95 Truck w/ 360 CRANE & Part Load Car Port. DAF 95 LKW Truck & Drag Trailer. 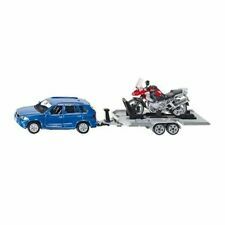 1 x 3-Axle Drag Trailer w/ CAR PORT / GARAGE. Text on Truck & Trailer: None. Near MINT in Box. 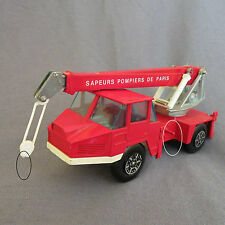 1:55 Fire Engine Crane Truck - Die-Cast Vehicle - Siku 2110. Made in Germany by SIKU. 1 Recycling CONTAINER for Glass. 1 Recycling CONTAINER for PAPER. Text on Truck: Umweltschutz zum Mitmachen. 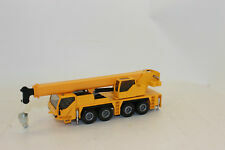 MATCHBOX KINGSIZE NUMBER 14 TAYLOR JUMBO CRANE IN YELLOW / RED COLOUR. Text on Truck: FEUERWEHR. Made in Germany by SIKU. MINT in Box. 3 Axle BIG Recovery Truck with AUTO-LOADER CRANE Action. 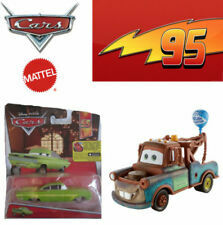 Matchbox'sClassic BATTLE KINGS Collectibles Diecast Model. Special Features: PRESS-A-MATIC Rear LIFTING ACTION with 2 HOOKS. Promotion Label on Truck: 66 Repair or maybe make you own. Again Wow ! Nor a penny. Extra Rare ! Limited Edition ! Limitierte Auflagen ! After 22 years of storage it's up for sale! Text on Truck: FEUERWEHR. Made in Germany by SIKU. Again Wow ! Nor a penny. I've checked the Model. It ' s 100% Perfect! Sealed from the Factory. Extra Rare ! Limited Edition ! Limitierte Auflagen ! Matchbox'sClassic BATTLE KINGS Collectibles Diecast Model. 3 Axle BIG Recovery Truck with REAR LIFTING Action. Special Features: Army Color & Rear LIFTING ACTION with 1 HOOK. Promotion Label on Truck: None or maybe make you own. Matchbox'sClassic BATTLE KINGS Collectibles Diecast Model. 3 Axle BIG Recovery Truck with REAR LIFTING Action. Special Features: Rear LIFTING ACTION with 1 HOOK. Promotion Label on Truck: SHELL or maybe make you own. Super Series from SIKU. - Super Series from SIKU. Warning: Not suitable for children under 36 months. This product is subject to specific safety warnings. Super Series from SIKU. Date First Available: 29 Feb. 2008. Batteries included?. Batteries Required?. In model is in excellent near mint condition the press a matic crane is not working and the pop rivet underneath has been removed I believe to try and fix the crane.